Each tool can be used to add a different flare to your hair style. 1.Pull hair back into a high ponytail and secure with elastic at the crown. 2. Place the hair bun donut at the very end of the ponytail and pull strands through the hole in the center. Starting in the front, smooth your hair over the donut, tucking the ends underneath. Try to disperse hair evenly around the donut. 3. Slowly roll the bun maker (along with your hair) down the ponytail until you reach the base. Flip the bottom side of the maker upward from the inside out with both hands. As you roll, tuck loose strands underneath the donut. When you reach the base, fill in gaps in the bun by spreading hair out. 4.Tidy up loose ends and strands by pinning them around the base. To make the bun fuller, gently tug and tease strands from the center portion of the bun outward. 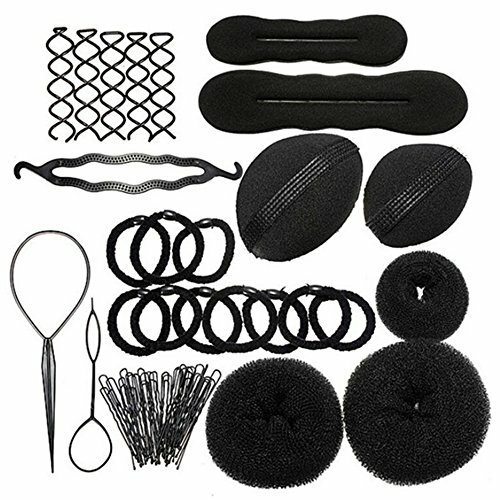 Features 8 different hair tools to help whip up a variety of fashionable looks. If you have any questions about this product by Sanwood, contact us by completing and submitting the form below. If you are looking for a specif part number, please include it with your message. Ponytail Holder by Woage, Ponytail Enhancer, Ponytail Volumizer for Hairstyle, Brown, Best Gift for Girls & Women.